Loading dock management isn’t always easy. As a business owner or facility manager, you already know that. Loading docks are constantly facing an uphill battle when it comes to safety standards and even security threats. Loading docks are hazardous working areas, with heavy machinery, fragile and sometimes dangerous cargo, and heavy traffic all creating potential risks and threats to your loading dock’s efficiency. And then there’s the vulnerability. Because of the valuable cargo that is coming in and out of our New York City loading docks, visitor management can sometimes be a problem. The FBI estimates that over $30 million in freight and goods are stolen from loading docks every year in the United States. The often open nature of loading docks is an invitation for theft, would-be criminals, and sometimes worse. Loading docks, as we all know, provide entry and access points to critical infrastructure within the building. Should the wrong type of person, such as a terrorist or even disgruntled former employee, gain access to these entry points, it could spell disaster. These attacks, which are many times violent in nature, can be damaging to the building, company reputation, and future of the business. Negative association with a major theft or some type of attack can also wreak havoc on your ability to rebuild your reputation and earn the trust of important clients. These are some of the main reasons why it’s imperative to properly manage your loading dock to not only be as efficient as possible, but also as safe as possible for your employees as well as secure for the sake of your daily and long-term business operations. 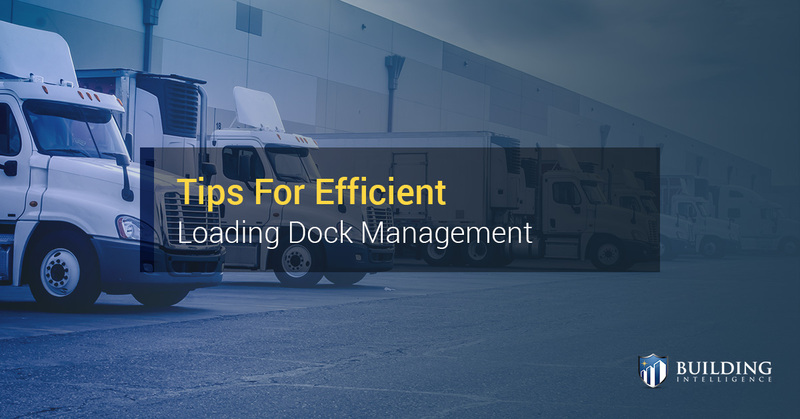 Here are some tips for efficient loading dock management. Having visitor management in New York City should be second nature to running your business or loading dock facility. Visitor management is important largely because it creates an environment where your employees, tenants, visitors, and drivers feel safe and secure. The most important aspect of visitor management involves being able to track and manage who is on your premises at all times, allowing you to eliminate the unknown altogether through a secure and advanced check-in and check-out process, proper I.D. checks and background screening, and more. In New York City, there is no better visitor management solution for a loading dock than SV3® from Building Intelligence. With SV3®, you get an all-encompassing, cloud based visitor management system which allows you to thoroughly vet any visitors who are attempting to enter your loading dock facility. This allows you or your facility manager to ensure that only authorized visitors are coming in to do what they are supposed to do, eliminating the risk of unknown, unauthorized, or rogue visitors from entering. You’ll also get up-to-the-minute vehicle access records of all authorized deliveries in the past, present and future. Your visitors will receive a customized QR code via email for their scheduled delivery or pick-up date, allowing you to implement multi-factor authentication support and validate the identity of visitors, their vehicles, and vendors for access approval, addressing backdoor and access point risks in the process. SV3® also gives you the ability to create a digital log of all past, present, and future vendors and visitors, their personnel records, and identities within one secure, private database, eliminating the need for paper logs and other less efficient record-keeping methods. You’ll also receive automatic upgrades to your software to ensure that it’s always up to date and working efficiently and properly. Having an effective visitor management solution is the first step in proper and efficient loading dock management, and can cover you from unwanted personnel, workplace violence issues, property damages, risk of theft, and much more. Call Building Intelligence to learn more today. Another important aspect of proper loading dock management is having a streamlined, efficient scheduling method for your vendors. Not having a proper schedule, or even overbooking your schedule, can create unwanted effects like bottlenecks, stress, wasted costs, delayed shipments, revenue loss, and ultimately a risk for a theft or attack in the commotion. Scheduling is another aspect that can be covered by a quality visitor management system like SV3®, however. With our cloud based, complete loading dock solution, you can make your shipments on time and on budget every time. How does a visitor management system work with scheduling your loading dock? With SV3®, you can create a network of frequently used vendors, schedule single occurrence, round-trip, and recurring deliveries, and access downloadable reporting of all the building activity for any given day. That way, you have a facility-wide, digital schedule of all the day’s activities which is set in stone and can’t be confused or lost in translation. It also gives you a daily manifest of expected arrivals, and provides notifications upon the arrival and departure of all authorized deliveries or vendors. This can also be beneficial with the transport of hazardous materials, as you can receive notifications upon that truck’s scheduled arrival in order to take the proper safety measures and preparations. You can allocate your important resources to other aspects of your daily loading dock management by allowing our SV3® software to be your scheduling solution. Of course, the safety of your loading dock and the people within it should also be a top priority for you or your facility manager. Make sure your employees and loading dock are safe and compliant with all OSHA standards in order to reduce the risk of accident or injury. Have an organized system which maintains the proper loading dock order and reduce traffic. You may even want to go as far as installing lights in every area and even on your heavy machinery like forklifts. Make sure everyone operating any type of equipment has the proper safety protocols memorized and the proper safety gear to do so. You should also prioritize your equipment’s maintenance to reduce the risk of malfunction or delays. These are just some of the ways in which you can improve your loading dock safety, security, and efficiency. To learn more about the SV3® facility management solution or to see if your facility qualifies for a proof of concept, contact Building Intelligence here.